Don’t like mayonnaise? 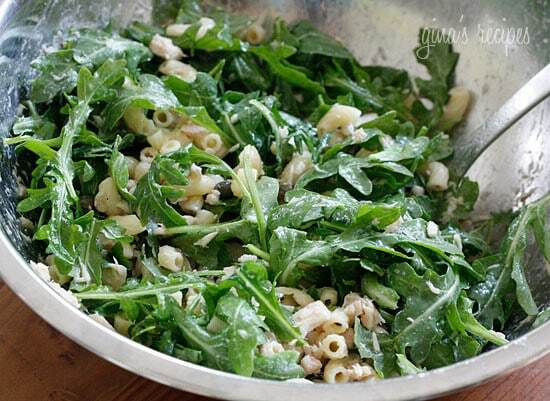 Then you’ll love this mayo-less tuna macaroni salad made with canned tuna, arugula, capers and pasta topped with shaved Parmigiano Reggiano, olive oil and vinegar. Delicious, satisfying and perfect for lunch – it’s tuna salad all grown up! I just love a cold tuna pasta salad on a hot summer day. More tuna salad recipes you may like are Chickpea Tuna Salad, Italian Tuna and Brown Rice Salad (Riso e Tonno), and Canned Tuna Ceviche. This salad comes together in minutes and it’s a great way to make canned tuna a little fancier. This would also work with canned salmon or crab meat instead, any pasta shape would do. 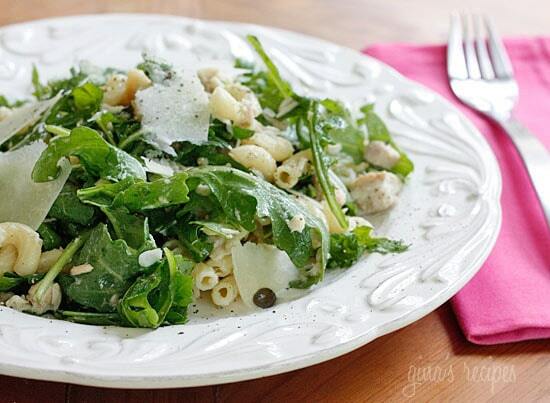 In a large bowl toss tuna with capers, oil, vinegar, arugula, pasta and pepper. 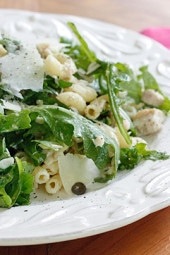 Divide on two plates and top with shaved parmesan.